New York City-based Jonathan Barber was voted the #1 Up-and-Coming Drummer of 2018 in Modern Drummer. Only 28 years old, he has already recorded and toured worldwide with such artists as Jeremy Pelt, Wallace Roney, J.D. Allen, Terrace Martin, Nicholas Payton, Marcus Strickland, Abraham Burton, Harold Mabern, Steve Davis, Stefon Harris, and many more. Barber has also been called on for such significant performances as Jimmy Greene’s Ana Grace Project (with an all-star band comprised of Greene, Kenny Barron, John Patitucci, and Kurt Elling) and back-to-back sold-out concerts with the Brooklyn Philharmonic and Erykah Badu at the BAM Opera House. 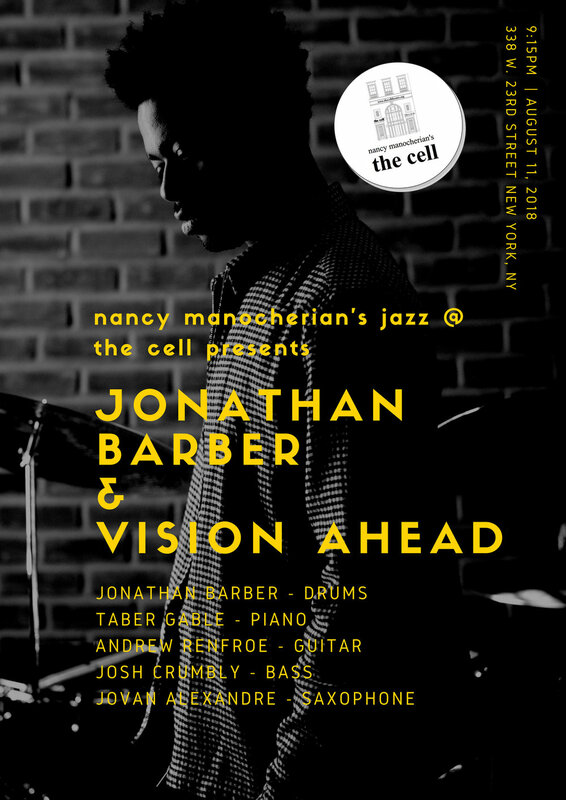 In addition to his first-call status as a sideman, Barber has recently stepped forth as a composer and leader with his Vision Ahead band, featuring saxophonist Godwin Louis, guitarist Andrew Renfroe, bassist Matt Dwonszyk, and pianist Taber Gable. Even with Barber’s history of high-profile gigs and recordings taken into consideration, DownBeat magazine calls Vision Ahead’s self-titled debut album his “greatest accomplishment to date.” Released on Rockwood Music Hall’s largest stage in May 2018, Vision Ahead is a powerful declaration of intent for a band that’s been making waves on the modern jazz scene since its debut performance at Jazz at Lincoln Center. The group’s blend of classic, swinging jazz with elements of gospel, rock, soul, and fusion is a compelling showcase of Barber’s broad stylistic range as a composer and performer. Vision Ahead is gearing up for national performances beginning in the summer of 2018 and an international tour in Russia (late August). Vision Ahead has been recognized as a finalists in the prestigious DCJazzPrix competition. Born in Hartford, CT, Barber has been playing drums since the age of five, initially falling in love with the instrument through watching his father perform in the family church. Barber’s upbringing in the church instilled within him a deep appreciation of the power, passion, and full sound of the gospel music tradition, and he now brings its infectious energy to the wide range of styles in his musical toolkit. Early influences also includes beginning George Duke, Fred Hammond, Weather Report, Yellowjackets and Commissioned, and classic jazz titans like Miles Davis, Jackie Mclean, Art Blakey, John Coltrane, Charlie Parker, Tony Williams and Thelonious Monk. With soul, impeccable groove, and explosive chops, Barber has synthesized his favorite traditions into a thoroughly modern and endlessly adaptable musical expression that connects with listeners from across generations. Following the Vision Ahead tour, Barber is looking forward to working on his next album and presenting drum clinics that highlight one of his greatest skills: finding identity in the music and bringing it to life for an audience. Barber endorses Canpous Drums, Istanbul Agop Cymbals, Evans Drumheads, Promark Drumsticks, and Sunhouse Percussion.